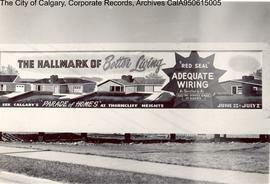 "Alberta Album" about Memorial Park, Calgary, Alberta. "At the moment they're negotiating salvage rights." "Best we re-check our charts, bos'un ... I don't recall ever seeing that lighthouse in these waters!" 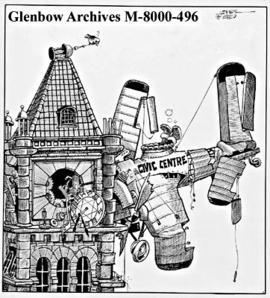 "Calgary Tower is taking it rather badly." "Call...to see who gets it."